One of the most fun, creative workouts you’ll ever do. And the beauty is you can change it up any time you want! Get yourself a standard deck of cards. Each suit will represent one exercise. For example, if hearts are burpees, you would do a set of burpees for every time a heart is drawn. Number cards will be face value (ex. 7 of hearts = 7 pushups). Jacks are 11. Queens are 12. Kings are 13. And Aces? They’re the most fun of all. 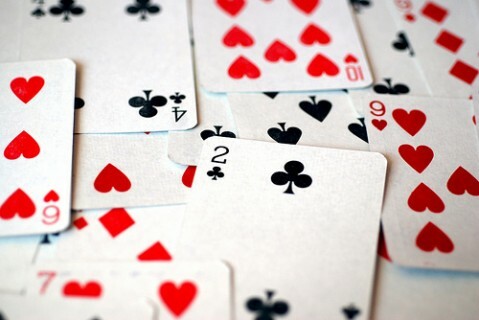 Aces are 15 reps. Jokers are optional, and can be set to any value. I typically assign some sort of pure cardio for a set amount of time to Jokers. For example, I may say the 1st joker drawn is 1 minute of jumping jacks. 2nd joker drawn might be 90 seconds of jumping jacks. Our Deck of Cards workout from May 15. It was a KILLER! So, now you’ve got your exercises. I’d recommend pasting up on the wall somewhere you can see them so you know what each suit represents. See my sample on the left. Simple. When there are weights involved, I typically change the font color to RED so that I know weights are needed for that exercise. It helps when you’re exhausted! Now, the workout! Shuffle the deck. Once you’re warmed up, grab one card from the deck. Do how ever many reps of whatever exercise correlates to that specific card (if you draw the Jack of Clubs and Clubs is Mule Kicks, do 11 Mule Kicks). Immediately draw your next card. If your second card is the 3 of diamonds, and diamonds is Toe Touch Pushups, do 3 Toe Touch Pushups and so on. Keep drawing cards, pushing yourself as hard as you can with as little rest as possible. 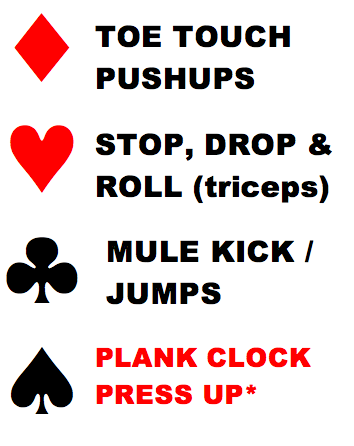 Deck of Cards are awesome because workouts can vary. You can set a clock to 20 minutes and work for all 20 and see what you get. Or you could work through the entire deck and see how long it takes you. You can change it up every time you do it. You can do 10 minutes. Maybe 45 one day. Or go for it, and do the whole deck. What’s so cool about the Deck of Cards workout is that a) you can change up what your 4 exercises are and b) even if you do the EXACT same exercises week after week, day after day, your workout will NEVER be exactly the same because you’ll never pull cards in the exact same order. Each shuffle of the deck will provide a new workout. You can perform several exercises with this protocol (ex. pushups, squats, burpees, pull-ups, etc.). Mix it up and have fun with it. I’m about to post our Deck of Cards – Legs on FIRE – workout from Tuesday. Click here to see it! This entry was posted in Workouts and tagged cards, deck of cards. Bookmark the permalink.